1, Unknown EB intermodal @ 9:11. Motive power was NS 9206 & NS 8878. 2. Unknown WB intermodal @ 9:15. It was held on the siding at CP SULLY for the previously mentioned EB. Motive power was NS 9542, NS 9082, NS 2741 and NS 7634. 3. NS 212 @ 11:40. Motive power was NS 9198, UP 9584 and NS 8709. 4. NS 18N @ 12:20. Motive power was NS 8102 and NS 9171. NS 8102 makes eight heritage photographed for me and only twelve to go! Hope that the remaining twelve are passing through NJ when its warmer! We have many exciting trips coming up this year. Please review the email below for all that we have to offer! 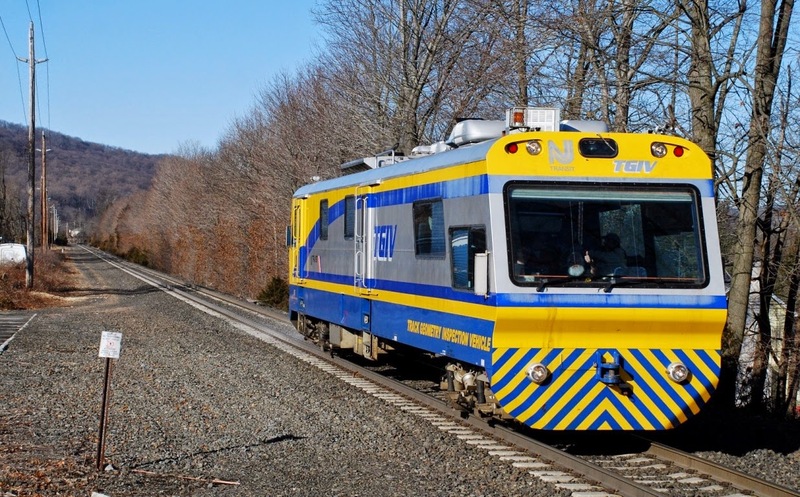 You may also ride the River Train along the scenic Delaware River to Pinchers Point, New Jersey ( an hour and fifteen minute round trip). For an added adventure take theRiver Train to the Ol' Susquehanna Mine , enjoy the animated Mine Shaft Explosion, History and learn how to pan for Gem Stones that you can take home!. Following article is from Yahoo News. Please see the website for photos. Like the Midnight Rider tragedy that took the life of Sarah Jones, Saturday’s railroad-filming accident in Burbank that killed actor and fitness guru Greg Plitt involved an attempt to steal a shot without a film permit or permission from the railroad company. “We require film permits if you’re outdoors, but there was no permit on file,” a spokesman for the Burbank Police Department said. The AMPTP Industry-Wide Labor-Management Safety Committee issued guidelines for Railroad Safety 10 months before Sarah Jones was killed. Unfortunately, those guidelines continue to be ignored. 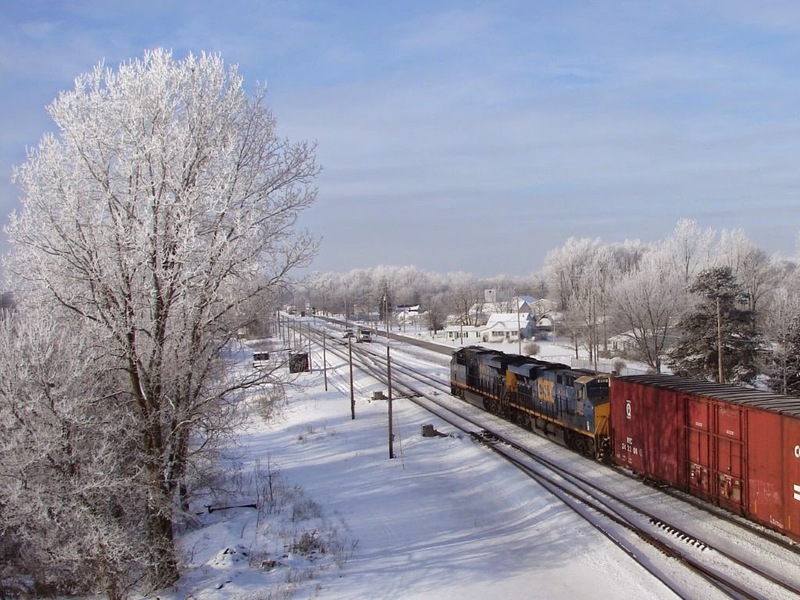 My friend Ken Heyl ventured out into the truly bitter cold with his camera and captured this frigid scene with hoarfrost covering the trees at New London, Ohio as this hot westbound CSX train swooped through the MP 47 Interlocking over well-maintained track on a brisk Wednesday a.m. (1-14-15) Those forced-air switch point heaters were sure earning their keep! ... is seen heading east over NJT's Raritan Valley Line on January 13th approaching Whitehouse Station (RVL MP 44.2). The TGIV is a self-propelled vehicle that is capable of examining both track geometry and catenary. Staffed with a three man crew, two vehicle operators and a computer systems operator, the TGIV records track geometry measurements every foot at up to fifty miles-per-hour. Manufactured by the Fairmont / Tamper division of Harsco Track Technologies, it cost an estimated $2.5 million and weighs in around sixty tons. This TGIV measures in at sixty-five feet long, ten feet eight inches wide and fourteen feet nine inches high. This one replaced a previous one that caught fire on September 17, 2002 while working NJT's North Jersey Coast Line. Received the following via email from the Garden State Division (GSD) of the NMRA. Limited seating, advance registration is required. Materials have to be ordered. The morning will start off with coffee and doughnuts and there will be AP judging, White elephant table, Bring and Brag, and two clinics. or you can sign up for this Make and Take clinic given at the clubhouse. Sometimes one has to take what is given to them when photographing a specific subject. Case in point is the scenario that presented itself to me on Saturday (December 10) when I hoped to photograph NS's 6963, a one of a kind unit honoring the Go Rail organization. This organization mobilizes support for policies that would lead to more freight moving by rail and opposition to policies that would limit the freight railroads’ ability to meet growing freight demand. Unfortunately the location did not provide the ideal conditions necessary to get a pleasing image. My best chance was to get a panning view as the 11J passed by my location in Three Bridges, NJ as the second unit. Oh well this image is better than no image, wouldn't you agree? JACKSONVILLE, Fla. - January 13, 2015 - CSX Corporation (NYSE: CSX) today announced record fourth-quarter 2014 net earnings of $491 million, a 15 percent increase from $426 million for the same period last year. The company also generated record fourth-quarter earnings per share of $0.49, up 17 percent from $0.42 per share in 2013. "CSX is capturing broad-based market strength, completing strategic infrastructure projects and adding resources to further improve service performance and leverage growth opportunities," said Michael J. Ward, chairman, president and chief executive officer. "Building on a foundation of strong safety and customer service, we expect to continue growing our intermodal and merchandise businesses faster than the economy, pricing above inflation, and driving efficient asset utilization." Fourth-quarter revenue increased 5 percent to $3.2 billion, with strength across merchandise, intermodal and coal. The timely addition of operating resources enhanced service through the fall peak shipping season and supported volume growth. As a result, operating income increased 11 percent to $901 million, and the operating ratio improved 140 basis points to 71.8 percent. For the full-year, CSX produced new all-time records for revenue of $12.7 billion, operating income of $3.6 billion, net earnings of $1.9 billion and earnings per share of $1.92. At the same time, the operating ratio remained relatively stable at 71.5 percent. Looking to 2015, CSX expects continued strong growth across its diverse business mix and is poised for sustainable business expansion. The company continues to expect to generate double-digit growth in earnings per share and margin expansion in 2015, progressing toward a mid-60s operating ratio longer term. CSX executives will conduct a quarterly earnings conference call with the investment community on January 14, 2015, at 8:30 a.m. Eastern time. Investors, media and the public may listen to the conference call by dialing 1-888-EARN-CSX (888-327-6279) and asking for the CSX earnings call. Callers outside the U.S., dial 1-773-756-0199. Participants should dial in 10 minutes prior to the call. In conjunction with the call, a live webcast will be accessible and presentation materials will be posted on the company's website at http://investors.csx.com. Following the earnings call, an internet replay of the presentation will be archived on the company website. CSX also uses social media channels to communicate information about the company. Although our social media channels are not intended to be the primary method of disclosure for material information, it is possible that certain information we post on social media could be deemed to be material. Therefore, we encourage investors, the media, and others interested in our company to review the information we post on the social media channels listed below. This list may be updated from time to time. CSX, based in Jacksonville, Florida, is a premier transportation company. It provides rail, intermodal and rail-to-truck transload services and solutions to customers across a broad array of markets, including energy, industrial, construction, agricultural, and consumer products. For more than 185 years, CSX has played a critical role in the nation's economic expansion and industrial development. Its network connects every major metropolitan area in the eastern United States, where nearly two-thirds of the nation's population resides. It also links more than 240 short-line railroads and more than 70 ocean, river and lake ports with major population centers and small farming towns alike. More information about CSX Corporation and its subsidiaries is available at www.csx.com. Like us on Facebook (http://www.facebook.com/OfficialCSX) and follow us on Twitter (http://twitter.com/CSX). 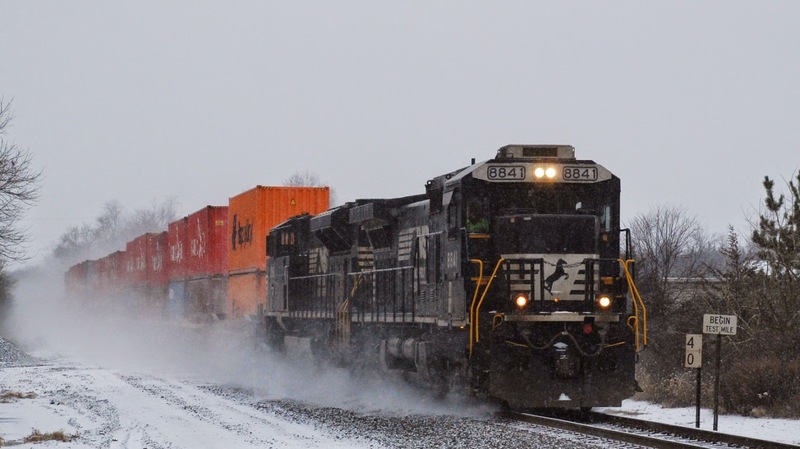 NORFOLK, Va., Jan. 13, 2015 -- Donald W. Seale, executive vice president and chief marketing officer of Norfolk Southern Corp. (NYSE: NSC), has announced his plan to retire effective March 1, 2015, Chairman and CEO Wick Moorman said today. NS’ board of directors will name Seale’s successor at a later time. Seale joined NS in 1976 as a management trainee. He served in numerous sales and marketing capacities relating to the railroad’s service to its merchandise and coal customers before being named senior vice president marketing services in 2003, executive vice president sales and marketing in 2004, and executive vice president and chief marketing officer in 2006. Seale’s tenure as leader of NS’ marketing division saw expansion in demand for quality rail service. The corporation recorded its first $10 billion railway operating revenues year and annual revenues increased by approximately $4 billion during that time. He championed new, more time-sensitive service offerings for producers, manufacturers, shippers, and receivers of coal, automobiles, chemicals, agriculture and consumer products, metals and construction materials, paper, clay, forest products, and intermodal trailers and containers. In the last three years, Seale’s team has been a leader in developing and marketing rail services to new and expanding businesses in the energy sector. He has also been a strong and tireless advocate of industrial development to spur new industries and jobs across the states Norfolk Southern serves culminating in $5.7 billion in new investments and over 4400 associated jobs in 2014 alone. Photo taken in 1965 at Erie, PA. Imagine one of these with a pair of 4,400 h.p., 12-cylinder GEVOs in it vs. the two 2,500 h.p. FDL-16s they actually had. ...to be trackside but was worth it in capturing some winter scenes with good sunshine. Case in point is where the LEHL crosses over the Raritan River in Neshanic Station (NJ). I was hoping to catch the H76 heading east to work Aeropres in Hillsborough. 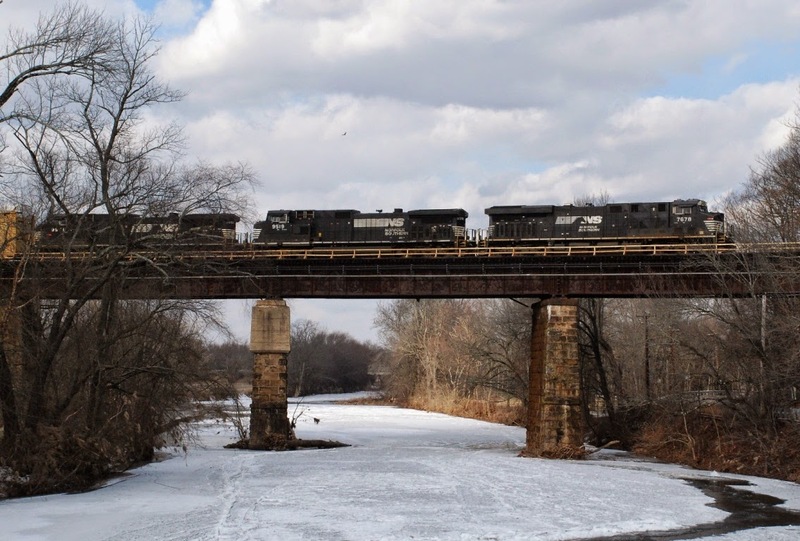 Instead I was surprised with this eastbound intermodal, possibly 212, crossing an partially frozen river. Motive power was NS 7678, NS 9519 and NS 9951. With the wind starting to pick up in velocity, it was time for me to head home and thaw out! 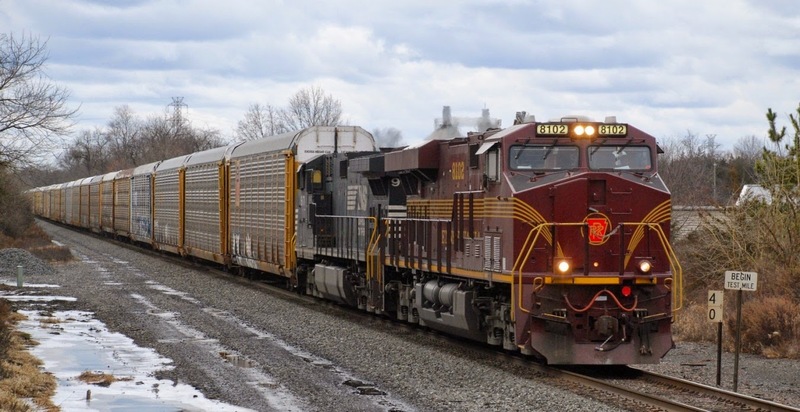 ALTOONA, PA. – The first emissions-friendly locomotives funded by the federal Congestion Mitigation and Air Quality (CMAQ) Improvement Program have been released for road testing by Norfolk Southern from its Juniata Locomotive Shop in Altoona, Pa. 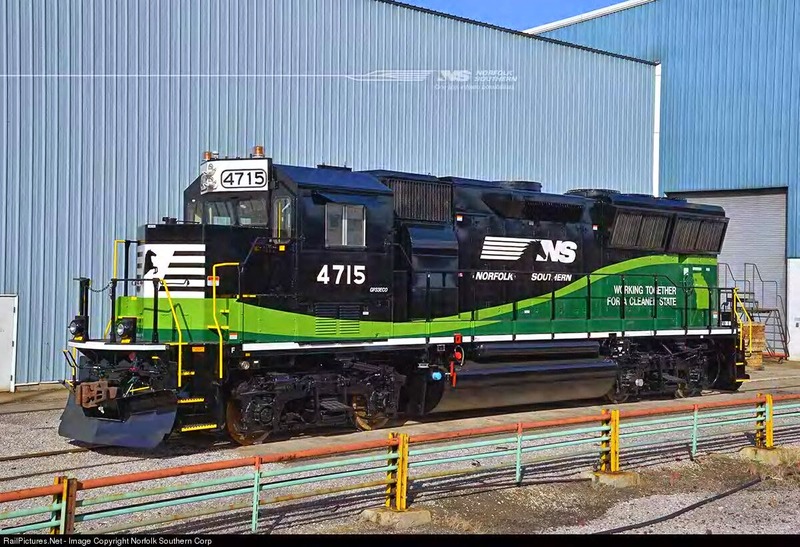 The first two GP33ECO switching locomotives – of a total 25 partially funded by CMAQ for production by Norfolk Southern – sport a distinctive paint scheme that reflects their environmentally friendly mission. After in-service testing in the Altoona area, they will be permanently assigned to their respective grant award areas of Chicago and Atlanta. 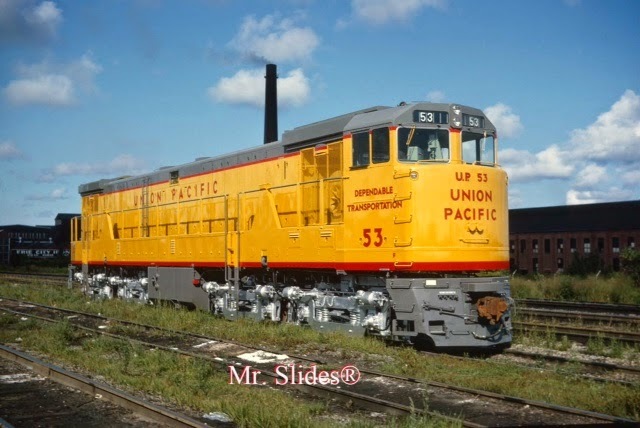 Funding for the locomotive to be used in the Chicago area was awarded by the Chicago Metropolitan Agency, sponsored by the Illinois Environmental Protection Agency, and administered by the Illinois Department of Transportation. Funding for the locomotive to be used in Georgia (on Norfolk Southern’s Atlanta Terminal) was awarded by the Georgia Department of Natural Resources Environmental Protection Division. Dedication ceremonies will occur in the months to follow. NJ TRANSIT's Raritan Valley Line will begin one-seat ride service starting Monday, January 12 with weekday evening off-peak hours. Train 5150 departing Raritan at 6:39 p.m. Train 5152 departing Raritan at 7:52 p.m. Train 5154 departing Raritan at 8:49 p.m. Train 5156 departing Raritan at 9:53 p.m. Train 5193 departing New York at 8:48 p.m. Train 5155 departing New York at 9:48 p.m. Train 5197 departing New York at 10:48 p.m. Train 5101 departing New York at 12:08 a.m.
Customers should check the new schedule effective January 11 for changes in other weekday afternoon/evening train times. ...finds NS 22V, a Harrisburg (PA) to Elizabeth Marine Terminal (NJ) intermodal, heading east over the LEHL at MP 40 around 10:11 AM on this snowy Tuesday morning. NS 8841 (GE C40-9) and NS 2766 (EMD SD70M-2) is the power consist that is kicking up the snow as it approaches the Valley Road grade crossing in Hillsborough, NJ. NORFOLK, Va., Jan. 7, 2015 -- Norfolk Southern assisted 94 industries in locating or expanding their businesses along its rail lines in 2014. The 72 new and 22 expanded industries represent an investment of $5.7 billion by Norfolk Southern customers and are expected to create more than 4,420 new jobs in the railroad's territory, generating more than 205,000 carloads of new rail traffic annually. Norfolk Southern assisted state and local government and economic development officials throughout 18 states in helping customers identify ideal locations for the projects. Norfolk Southern works with state and local economic development authorities on projects involving site location and development of infrastructure to connect customers to its rail system and provides free and confidential plant location services, including industrial park planning, site layout, track design, and supply chain analysis. During the past 10 years, Norfolk Southern's Industrial Development Department has participated in the location or expansion of 1,017 facilities, representing an investment of $57 billion and creating more than 44,000 customer jobs in the territory served by the railroad. JACKSONVILLE, Fla. - January 5, 2014 - In 2014, CSX and its customers worked together on 107 projects to build or expand facilities on CSX's network and short line partners. CSX customers invested more than $3.5 billion in these projects, which are expected to generate nearly 5,800 new jobs in local communities and approximately 161,000 annual carloads of new business for CSX. "In 2014, the bulk of customer investments along our network involved expanding and improving infrastructure for the energy sector. Low natural gas prices are also fueling more downstream projects in the chemicals and fertilizer arena, as well as other manufacturing industries," said Clark Robertson, assistant vice president - regional development. "We've seen investments from both domestic and multinational companies along our rail network, in part due to the CSX network's ability to reach nearly two-thirds of American consumers. We see strong indicators that this robust activity will continue into 2015." Over the past decade, CSX customers invested more than $30 billion in rail-served facilities, creating more than 36,000 jobs across the company's 23-state network. "State and local economic development agencies also play a pivotal role in supporting economic opportunities for new manufacturing facilities," Robertson said. "We appreciate their assistance in helping our customers access our 21,000 mile rail network and the benefits that freight rail provides, including improving their environmental footprint and helping to reduce wear and tear on public roads." To further expand opportunities for customers to develop on the company's network, the CSX Select Site program certifies properties expressly intended for manufacturing uses. These properties meet rigorous permitting and certification criteria to ease the development process and promote efficient timelines for customers. More information on the CSX Select Site program is available at www.csxselectsite.com. CSX also recently launched a new online platform to support industrial development across its network, www.csxindustrialdevelopment.com. The site allows potential and current customers to search by specific facility needs, and connects customers with CSX's Select Site program and proprietary Site Design services. Please join us to review our fourth-quarter and full-year 2014 financial results during a conference call and live Internet webcast at 8:45 a.m. Eastern Time on Monday, Jan. 26, 2015. Quarterly earnings results will be released at 8 a.m. ET on Jan. 26. You can listen to the call by dialing 877-869-3847 several minutes prior to the start of the conference. In conjunction with the call, a live webcast will be accessible and presentation materials will be posted on the company's website at www.nscorp.com under the Investors section. Following the live broadcast, an audio replay of the conference call will be available until Feb. 2, 2015, by dialing 877-660-6853 and access number 13597919. The replay also will be available as an MP3 downloadable podcast in the Investors section of the company’s website. JACKSONVILLE, Fla., (January 5, 2015) - CSX Corporation (NYSE: CSX) will release fourth-quarter financial and operating results on Tuesday, January 13, 2015, after the market close. The company will host an earnings conference call at 8:30 a.m. Eastern Time on Wednesday, January 14, 2015 via teleconference and a live audio webcast. CSX announces material financial information through the Investors section of our website (http://investors.csx.com), SEC filings, press releases, public conference calls and webcasts. We also use social media channels to communicate information about the company. Although our social media channels are not intended to be the primary method of disclosure for material information, it is possible that certain information we post on social media could be deemed to be material. Therefore, we encourage investors, the media, and others interested in our company to review the information we post on the social media channels listed below. This list may be updated from time to time.